Today it is commonly accepted that the effectiveness of instructional technology, measured as improvement over the learning outcomes of students, is highly cor- related with the learning environment, the applied pedagogies and the goals of the participants of the learning process. The often applied passive lecture model and the undirected use of modern technology such as student laptops and smart- phones has been associated with increased levels of inattention and poor student performance. To address this, our work is focused on creating instructional technology for orchestrating traditional post-secondary brick-and-mortar classrooms of computer science education where active learning is the pedagogy of choice. We promote active learning during interactive lectures featuring retrieval practice with open practice question types of all answer depth formats(recognition, cued/free recall) directly integrated with slides. These turn student devices from a source of distraction to a learning affordance. Moreover, we take advantage of modern real-time Web technologies and machine learning techniques to allow timely and effortless gathering, assessment and classification of all student responses and activity during lectures thus tackling issues of scale with extrinsic classroom activities. 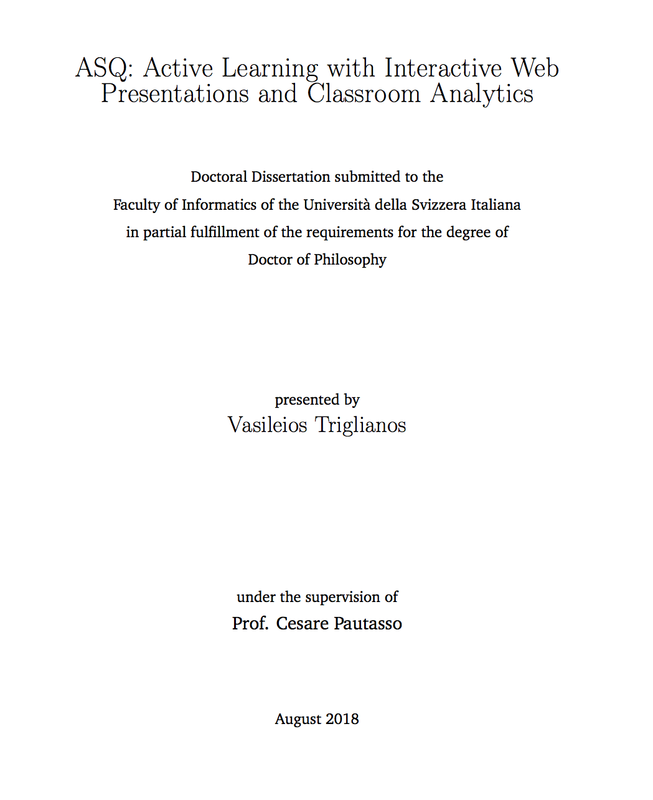 This dissertation introduces ASQ, a Web application for increasing teacher awareness by (i) turning student’s devices from distraction tools to learning affordances; (ii) facilitating the application of active learning with the use of question types of various formats and depth; and (iii) utilizing real-time data analytics to facilitate the collection of students submissions, accelerate feedback cycles and infer student behaviors dynamics. With ASQ lecture slides are transformed into an interactive social playground for knowledge construction where students ex- periment with the presented material (individually or collaboratively), answer questions and continuously give feedback about the lecture quality. We reinforce the role of teachers as the driver of classroom activity by providing them with information to follow the progress of the learning process, spot learning gaps or misconceptions early and provide feedback when needed. We begin by focusing on the engineering aspects of such an application and discusses in depth how to architect interactive presentations for the Web and design an extensible set of active learning question types for live audiences. Next, we move to the educational technology domain and combine several longitudinal case studies in real-world computer science courses involving hundreds of students, which showcase the potential of a data-driven approach to infer students dynamics and design more engaging lectures, with student and instructor evaluation studies of ASQ to confirm its the suitability as lecturing tool in the modern classroom.